These almond flour recipes are totally delicious, and are a great reason to introduce yourself to using almond flour. 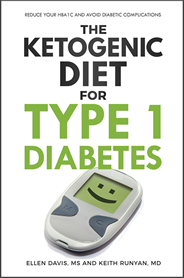 It's pretty amazing what you can do with this nutritious and versatile low carb staple. Line a mini muffin tin with paper muffin cups. In a small bowl, stir together dry ingredients, than add wet ingredients and mix well. Spoon into mini muffin tin, mounding up above edge of each cup. Bake for about 20 minutes or until golden on the edges. Let cool for about 1 hour before serving. Otherwise the papers will stick. Makes 12 mini biscuits. Note: These have a tendency to get soggy over time. For next day goodness, warm them again at 300 degrees F for about 10 minutes. 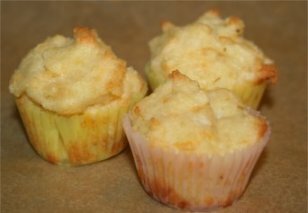 Variation: Fill each muffin cup with only 1/2 the amount of mixture, push into the middle a piece of cooked pork sausage or a 1/2" cube of Brie cheese, then cover with the other 1/2 of the spoonful of mixture. Make sure to seal the edges of the mixtures, otherwise the brie will bubble out. Bake as usual. Adjust for additional calories, carb counts will be about the same. Nutrition in one muffin: 97 calories, 9 grams of fat, 3 grams of carb, 1 gram of fiber, 3 grams protein. Most almond flour recipes for crackers use parchment paper. You can find it in any grocery store. Make sure to use parchment paper and not wax paper. In a smaller bowl, whisk together wet ingredients and then add to dry ingredients and mix well. Lay out two sheets of parchment paper the same size as your baking sheet. Roll the dough out in the shape of rectangle between the parchment paper sheets. Make sure to get an even thickness overall, or the edges will burn. Remove top paper, and cut dough into 2 inch squares with a pizza cutter. Place bottom sheet with dough on a baking sheet, and bake for about 15-20 minutes or until golden around the edges. Let cool for about an hour before breaking apart. Makes about 30 crackers. Nutrition in one cracker: 45 calories, 4 grams of fat, 1 gram of carb, .5 gram of fiber, 2 grams protein.